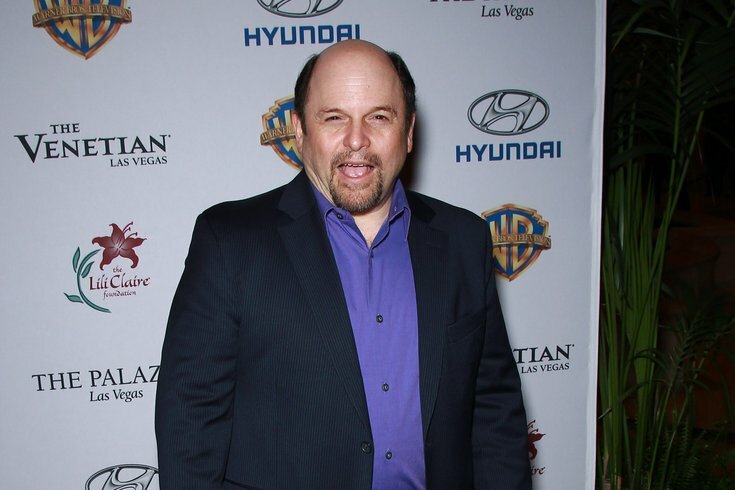 Jason Alexander arrives at the Lili Claire Foundation Star-Studded Benefit Concert and Poker Tournament at The Venetian Las Vegas on Nov. 15, 2014. It’s no secret that the “Seinfeld” character George Costanza shares more than a few idiosyncrasies with his creator, Larry David. But according to the man who brought George to life for nine hysterical seasons in the late-1980s and early ‘90s, David was not his initial inspiration. “When I first encountered the project, I didn't have a script,” recalled Jason Alexander during a recent phone call occasioned by his Sept. 29 fundraising gig for the Bay Atlantic Symphony at Borgata Hotel, Casino & Spa. “I was in New York, and [series creators Jerry Seinfeld and Larry David] had not fallen in love with [any actors vying to play George], or if they had, they couldn't make a deal. So, they were putting a couple of New York actors on videotape, and I was one of a handful of guys that received four pages of the original pilot. No script, just four pages. “In those four pages, I did a lot of guessing because it felt like a Woody Allen movie to me. So that's where the glasses came from, and I actually--forget a New York accent--I did a blatant imitation with the stuttering and the spitting. The 59-year-old actor-singer, who began his career as a New York-based stage actor specializing in musical theater, added that one person he never really thought about when crafting his character was himself. “Around five, six, seven episodes in, I had an epiphany that Larry was using George as a sort of personal avatar, and then Larry became my role model,” explained Alexander, who is currently portraying Col. Sanders in KFC commercials. That, he noted, was a function of the sitcom format. “You have so little information when you do a character on a series. They haven't done this huge backstory. People used to say to me when my [TV] parents showed up, 'Oh, now I understand how you built that whole character.' And I would say, 'Really? Because that was four seasons in.' You're just grabbing at straws and guessing and just trying to make it funny, so I would use role models of comedy I thought were applicable to George and run them through the filter of Jason. As for his upcoming Borgata bash, Alexander was hardly immodest when describing the program which blends music and comedy. “It's a really good time,” he said of the presentation that had its origins in a 1996 PBS special he did with the Boston Pops. “As you might imagine, it's not your ho-hum symphony show. It is rather irreverent. It has proven to be a rather funny evening. It’s a little bit more like if you were spending a fun evening with me in my living room, and I occasionally got up to sing some songs, but there just happens to be a whole bunch of great musicians behind me. The personal payoff, he offered, is that it combines his first love—show tunes—with the live audience experience. “What got me into the biz was my love of musical theater,” he said. “My fantasies about what a great career would be were all about doing theater--specifically musical theater--in New York if I could. I get to do a show that is all songs from the theater and sort of tell an autobiographical tale of why I love this music so much. “I love doing the material. I love the live audience experience. Everything about this show is kind of a great time. Everything was handpicked; it's music I love doing. It's music the audience seems to love hearing. [The set list] is very diverse. You might think it's just show music that's gonna be old or stale stuff, but it runs the gamut from Billy Joel to Stephen Sondheim. And there's a fantastic finale sequence where I have a nine-minute medley of every Broadway-musical role that is not right for me.